In nature shells provide varying forms of protection, from snails that use them to shelter their soft bodies from predation and drying out, to bird’s eggs that defend the growing embryo. 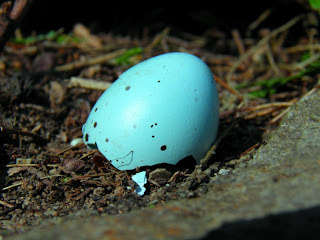 This week I picked up a discarded egg shell of a Song Thrush (Turdus philomelos), characteristically a stunning summer sky-blue with sparing dark speckles. A couple of weeks ago I was dazzled by brightly coloured Painted Topshells (Calliostoma zizyphinum) dotted about on low tide rocks near Torquay. This led me to wonder at the biological function of some species having such visually distinctive shells that might make them more prone to predation. Considering the Song Thrush there is some consistency with other birds that make their nests in darkened habitats and pale blue eggs. The Song Thrush chooses either a thick hedgerow, hollow in a creeper, or rarely if on the ground in a shady well-hidden site. It was believed that the distinctive colour may help the adults locate them more easily (Harrison, 1975). Many alternative theories of why thrushes lay blue eggs was summarised by Gotmark (1991): they may be cryptic and provide camouflage by imitating spots of light on green leaves; egg parasites such as cuckoos might have exerted selection pressures historically; the pigmentation of eggs enhances the strength of the egg shell and therefore its resistance to cracking; egg coloration influences egg temperature helping with its regulation. More recent research has tried to test whether the blue-green egg colouration of many bird species provides a health indicator of the female to allow males to modulate their parental investment. However it would appear that researchers are still really none the wiser and so we can only assume that the cost of producing blue pigment is outweighed by some unclear benefit that may no longer be relevant, or that it is simply maladaptive. The Painted Topshell is the most colourful example of these intertidal molluscs in the UK. The colour varies from yellow or brown to pink or purple and is overlaid with irregular dark purple or red markings. 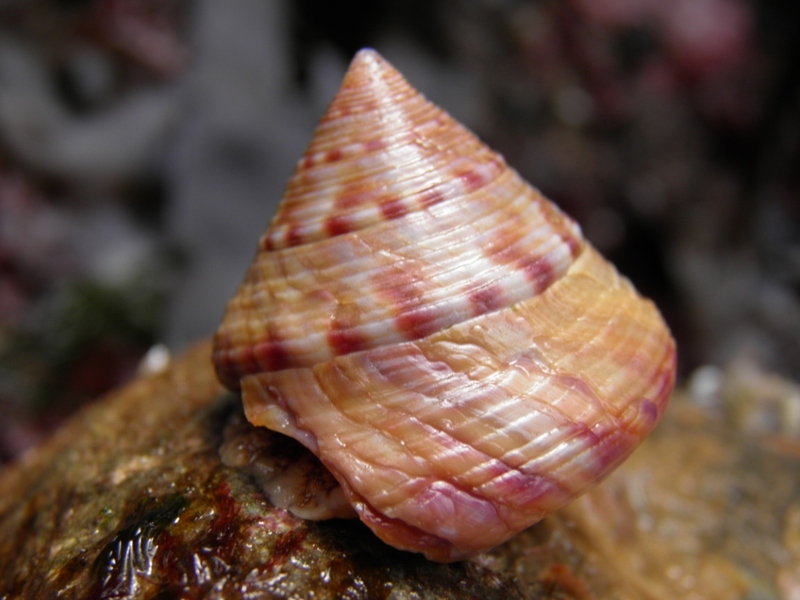 The purplish blotches spiralling around the almost perfect conical shell give the illusion of a spinning top. There is also a white ‘morph’ form which is considered by some to be a separate species. This Topshell is also notable for its frequent shell-wiping behaviour, which would appear to both prevent surface fouling and top up its food intake by as much as a fifth (Holmes, 2001). Despite this interesting colour variation I can find no explanation to its cause. So whilst scientists continue to hypothesise I humbly suggest that we simply sit back and admire nature showing off its surprising beauty. Harrison, C (1975) A Field Guide to the Nests, eggs and Nestlings of British & European Birds. London: Collins.